Bill Lester was born on May 14, 1936, in Illinois. He enlisted in the U.S. Army on January 12, 1954, and after completing basic training, airborne school, and special forces training, he served with the 77th Special Forces Group at Fort Bragg, North Carolina, until he left active duty on January 11, 1957. Sgt Lester next enlisted in the U.S. Air Force on October 31, 1957, and served as a Medical Service Specialist at Stead AFB, Nevada, from October 1957 to September 1958, followed by service as a Medical Service Specialist with the 735th Aircraft Control and Warning Squadron at Nouasseur AB, Morocco, from October 1958 to November 1959. He served as a Medical Service Specialist at the 328th U.S. Air Force Hospital at Richards-Gebaur AFB, Missouri, from November 1959 to September 1961, and then as a Medical Service Specialist with the 787th Radar Squadron at Chandler AFS, Minnesota, from September 1961 to February 1962. 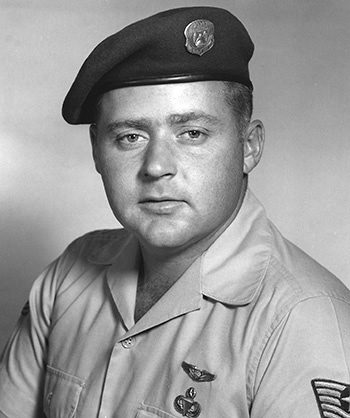 Sgt Lester next completed rescue and survival specialist training, and then served as a pararescueman with the 54th Air Rescue Squadron at Goose AB, Labrador, Canada, from February 1963 to June 1964. His next assignment was as a pararescueman with the 67th Aerospace Rescue and Recovery Squadron at Prestwick, Scotland, from June 1964 to August 1967, followed by service as a pararescueman with the 48th Aerospace Rescue and Recovery Squadron at Eglin AFB, Florida, from August 1967 to July 1968. He served as a pararescueman with the 40th Aerospace Rescue and Recovery Squadron at Udorn Royal Thai AFB, Thailand, from July 1968 to July 1970, and then with the Aerospace Rescue and Recovery Training Center at Eglin AFB, and then at Patrick AFB, Florida, from July 1970 to February 1971. During this time, TSgt Lester served as a pararescueman aboard the HH-53 Super Jolly Green Giant "Apple Two" during the Son Tay Raid, a clandestine mission to rescue American Prisoners of War in North Vietnam on November 21, 1970. MSgt Lester next completed refrigeration school, and then served as a refrigeration specialist with the Civil Engineering Squadron at Patrick AFB and then at Malmstrom AFB, Montana, until he retired from the Air Force on November 1, 1974. 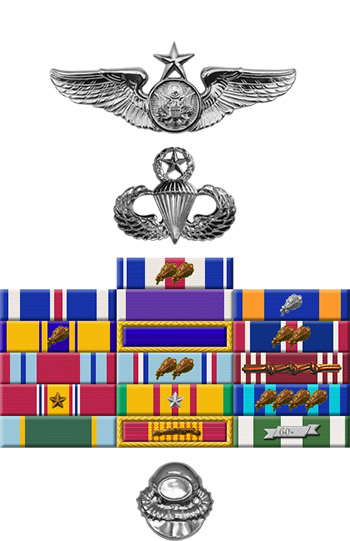 Technical Sergeant William E. Lester distinguished himself by gallantry in connection with military operations against an armed enemy of the United States during the Prisoner of War search and rescue operation at Son Tay, North Vietnam, on 21 November 1970. On that date, Sergeant Lester, flying as a Paramedic/Gunner in a helicopter carrying part of the ground rescue party, flew deep into the heart of enemy territory in a bold night attempt to rescue American Prisoners of War. His accurate fire on extremely critical enemy targets contributed significantly to the sense of complete confusion and disorganization among the enemy and provided protection for the rescue party. The personal skill and extreme courage displayed by Sergeant Lester in his aggressive fire during the heroic rescue attempt contributed immeasurably to the ultimate effectiveness and tactical success of the mission. By his gallantry and devotion to duty, Sergeant Lester has reflected great credit upon himself and the United States Air Force.